Learning about Chicago&apos;s vibrant LGBTQ history makes for a great cultural excursion and is a terrific way to see and experience different parts of the city. 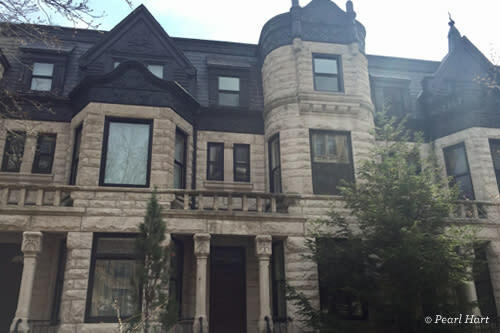 Starting on the South Side in the Washington Park and Woodlawn neighborhoods and moving north to Rogers Park, here is a listing of the historic markers and residences of some of Chicago&apos;s top LGBTQ luminaries of the past. 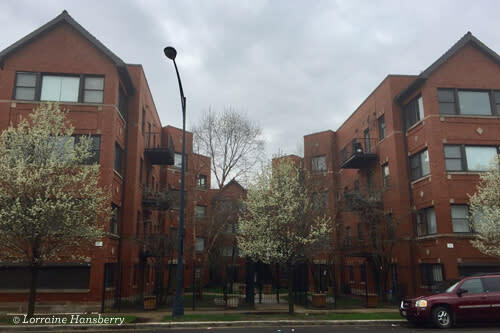 Lorraine Hansberry (1930-1965) lived in this Washington Park building from 1945-1950. Chicago native Lorraine Hansberry&apos;s award-winning play about a struggling African American family, A Raisin in the Sun (1959), was the first play written by an African American woman to be produced on Broadway. She was also the first African American playwright and the youngest American playwright to win a New York Critics&apos; Circle Award. In the 1950s Hansberry began to first identify herself as a feminist and lesbian. In 1957 she became a member of the groundbreaking lesbian organization, The Daughters of Bilitis. She wrote several essays and letters for The Ladder, the organization&apos;s newsletter under her initials L.H. Hansberry died of cancer on January 12, 1965 at age 34. She was posthumously inducted into the Chicago LGBT Hall of Fame in 1999. This home is one of the Chicago Tribute Markers of Distinction. If you are in the area, check out this 1909 brick building in the nearby Woodlawn neighborhood. The Chicago landmark was Lorraine Hansberry&apos;s childhood home which her father, a real estate developer, bought in 1937. When the family moved into this restricted white neighborhood shortly thereafter, they received threats of violence and a brick thrown through a window. When the court forced them to move, Hansberry&apos;s father challenged the decision. The conflict resulted in a three-year legal battle and a U.S. Supreme Court decision which was key in ending discriminatory housing covenants (agreements among white neighbors not to sell to Blacks). In 1889 Jane Addams founded Hull House in Chicago with Ellen Gates Starr. This settlement house, built in 1856, is dedicated to Addams and the Women of Hull House. Jane Addams (1860-1935) was a U.S. Social Justice pioneer, an author, an iconic figure for social justice, and a champion for those who lived on the margins of society. Addams was a leading feminist, a pacifist, a suffragette, and a lesbian. She brought attention to poverty, child labor, public health, race relations, adverse working conditions, and many more important social issues. She was instrumental in establishing the American Civil Liberties Union and won the Nobel Prize in 1931, becoming only the second woman in history to receive that honor. The love of her life, Mary Rozet Smith, arrived at Hull House in 1889. Their relationship lasted more than 40 years. Addams was inducted into the Chicago LGBT Hall of Fame in 2008. 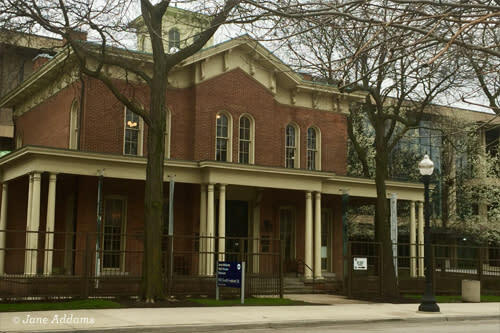 The original site is now the Jane Addams Hull-House Museum and is open Tuesdays-Fridays and Sundays, with public tours held weekly. This stone front row house, built in 1885, is a Chicago landmark and was the home of gay rights pioneer Henry Gerber (1892-1972). In 1924, Gerber founded the first known homosexual rights organization in the United States, the Society for Human Rights. The group was a precursor to the Mattachine Society (1950) and the birth of the modern gay rights movement. The newsletter Gerber published for the Society for Human Rights — Friendship and Freedom — is also considered to be the first documented gay rights publication in the country. Sadly, the organization lasted only a year, ending when a member&apos;s wife discovered a copy of Friendship and Freedom among his belongings. Gerber&apos;s flat was raided and searched. All materials pertaining to the organization were confiscated. The case was later dismissed due to lack of a warrant, but by then Gerber had been fired from his job as a postal worker. Soon after, he left Chicago for New York. Gerber died on New Year&apos;s Eve 1972 at age 80. Gerber was inducted into the Chicago LGBT Hall of Fame in 1992. Chicago&apos;s LGBT Library and Archives, Gerber/Hart, bears his name as well as that of Pearl Hart. 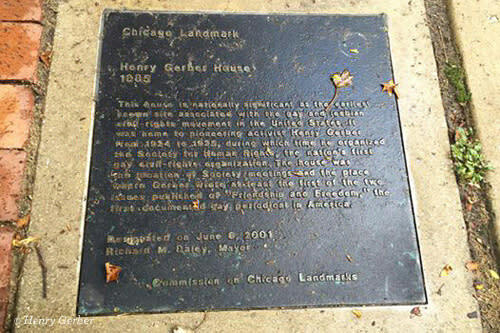 The Henry Gerber House, a National Historic Landmark, is located at 1704 N. Crilly Ct., Chicago, IL 60614 with the marker embedded in the sidewalk in front. This attractive stone townhouse, built in 1891 was the residence of Pearl Hart (1890-1975). Known as "The Guardian Angel of the Gay Community," Hart was one of the first female attorneys in Chicago to specialize in criminal law. She was admitted to the Illinois State Bar in 1914 and, as an attorney, was known for defending immigrants, lesbians and gay men, children, and other frequently oppressed groups. She often did this gratis or for a reduced fee. Hart was an ardent defender of gay rights and was one of the founders of the LGBT rights organization Mattachine Midwest. Hart was inducted into the Chicago LGBT Hall of Fame in 1992. Chicago&apos;s LGBT Library and Archives, Gerber/Hart, bears her name along with Henry Gerber. Hart&apos;s longtime partner, pulp lesbian novelist, and activist Valerie Taylor, lived only two blocks away. 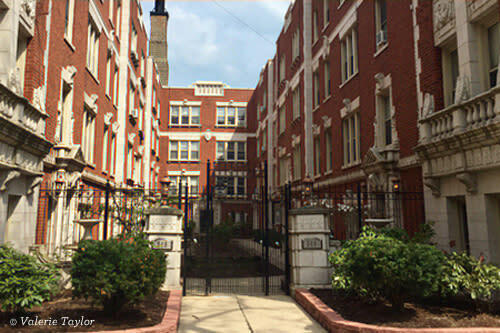 For ten years, a unit in this majestic 1929 stone courtyard building was the home of popular lesbian pulp fiction novelist and longtime Chicago resident, Valerie Taylor whose groundbreaking books include "The Girls in 3-B", "Return to Lesbos", and "Journey to Fulfillment". Taylor was key in starting the LGBT rights organization, Mattachine Midwest and many of the organizations newsletters were written in her apartment here. During her ten years as a resident of this building, she was also the partner of lesbian attorney Pearl Hart who resided two blocks away. Taylor was inducted into the Chicago LGBT Hall of Fame in 1992. She died in Tucson, AZ. in 1997 at age 84. Lesbian publisher and editor Margaret C. Anderson (1886-1973) moved to Chicago in 1908 and in 1914 founded the profoundly important avant-garde literary magazine, The Little Review. In 1916, Anderson met Jane Heap (1887-1964) and the two women became lovers and co-editors of the magazine. The Little Review published some of the most important writers and thinkers of the time — Ezra Pound, Gertrude Stein, William Carlos Williams, Jean Cocteau, Emma Goldman, Max Ernst, etc. In 1918, when the magazine began to serialize James Joyce&apos;s Ulysses, Anderson and Heap were arrested on obscenity charges, fingerprinted, and fined. The final issue of The Little Review was published in 1929. Anderson died of emphysema at age 86 in 1973. Anderson and Heap were both inducted into the Chicago LGBT Hall of Fame in 2006. 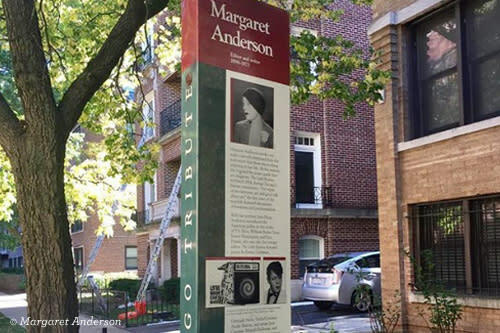 The Chicago Tribute Markers of Distinction for Margaret C. Anderson is located outside her former home at 837 W. Ainslie Street, Chicago, IL 60640. This marker honors Chicago native, children&apos;s television pioneer, and puppeteer Burr Tillstrom (1917-1985). Tillstrom was the creator of Kukla, Fran and Ollie and the winner of over fifty entertainment industry awards, including five Emmys. Stephen Sondheim, as a young man, even wrote a TV song for Kukla and Ollie. Tillstrom&apos;s longtime partner was Joseph Lockwood, Jr., stage manager and costume designer for Kukla, Fran and Ollie. The two men spent many summers vacationing in Saugatuck, MI. After Tillstrom&apos;s passing, the popular gay resort town honored him with a commemorative statue. Tillstrom died in Palm Springs, CA. at age 68. Tillstrom was inducted into the Chicago LGBT Hall of Fame in 2013. The Chicago Tribute Markers of Distinction for Burr Tillstrom is located outside his former home at 1407 W. Sherwin Avenue, Chicago, IL 60626.